All our collaborators are licensed tourist guides, which means, among other things, they have instant access to even the most crowded museums and venues*. Meet our Barcelona Tour Guides. Who owns and runs this site? Company name: Barcelona Tour Guides s.c.p. 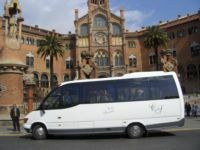 Who guide your private tours of Barcelona? Which transport do you use for your private tours? We hire comfortable (AC, PA system, panoramic windows, wide trunk for luggage, easy step-in and out, polite and helpful drivers, etc.) according to the size of your party that are provided by registered operators meeting the legal (insurance) and technical requirements for the transport of passengers. Though to cater to all travel budgets we also do walking tours and tours by public transport (combination of cabs, city buses, etc. ), whose cost will be lower. Why a guide AND a driver? Because parking (and even pick up and drop off) spots close to the sights are just too scarce and many sites of interest are located in pedestrian-only areas; even if we used a guide-driver parking and unparking would take a lot of expensive tour time. With separate guide and driver, you are dropped and picked-up very close to the sights, the guide is with you at the sites to take you directly to the important spots, avoiding crowds, pickpockets and other hassles. 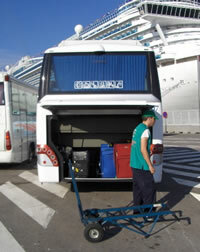 And your belongings are safe while you are sightseeing with your guide as the driver will not leave the car unattended. If you cannot afford both, keep the guide for a tour by foot and / or taxis and public transport as needed. For payment by credit card, we do have a secure and confidential payment gate. Bottom line: You will not be attended by an exploited and underpaid staff but by smiling and well paid professionals committed to their job and happy to attend you. Where do your private tours start and end? Our private tours start and end at the place of your choice in Barcelona, i.e. your hotel, a restaurant, etc. Extra charges for hotels out of town (according to distance) or the Airport. Benefits of a private tour? Our tours are very easy to arrange: our reservation and payment procedures are simple and straightforward. Your main benefits will be: privacy, comfort and freedom of movement, and at your own pace. You make the most of your short time in Barcelona. As much as we can we try to stay one step ahead of the crowds even at the busy venues. We also have instant access to sights and museums. Cost-wise, with parties of 10-plus, our private tours cost just about the same than similar mass-organized tours sold on an individual basis. For smaller parties, we are cheaper than most luxury service providers because there are no intermediaries: you are in contact with the very professionals who will attend you. How do I arrange a private tour of Barcelona? Fill the booking form for the tour you are interested in. Reconfirm a few days before the tour and that's it! In some cases (airport transfers, tours starting at an incoming flight, etc.) we may ask for a credit card number as a guarantee or request a down payment. No cancellation fee if you cancel with more than 72 hours notice. Full amount due if you cancel within 72 hours of the tour(s) or do not show up. The Penedes Wine Tour has its own steeper cancellation policy: full amount due if you cancel within 10 days of the tour. If you are taking a cruise and your ship does not moor for unexpected reasons such as a storm, a strike, etc. No cancellation fees due. What do your tour prices include? Our tour prices include all related expenses (parking, toll taxes, guide and driver lunch allowance, etc.) except your entrance fees at the venues you wish to visit and personal expenses. We are fully committed to respecting your privacy and to protecting any information you provide and will not share your details with third parties. and plenty of space for your luggage!